With 100 guest rooms and suites and a sprawling, ten-acre setting, Brookside Resort is ideal for group gatherings in Gatlinburg. Whether you’re planning a destination wedding, family reunion, school or church retreat, or small corporate meeting, our combination of affordable accommodations and thoughtful amenities set the stage for success. 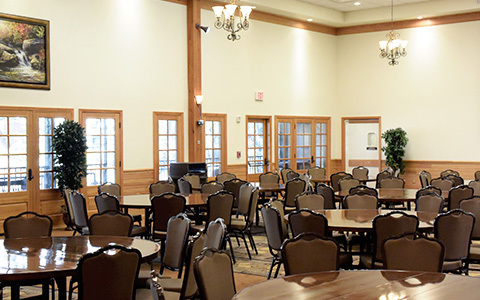 Brookside Resort offers guests easy access to the Gatlinburg Convention Center, a favorite facility for meetings, trade shows, religious conferences, association meetings and cheerleading and dance competitions. In addition to offering a free hot breakfast and plenty of recreational diversions on-site, the Brookside Resort staff can work with you to plan Gatlinburg excursions and experiences and full-service off-site catering through our own Great Smoky Mountain Catering Company. Whatever type of event or group travel experience you’re planning, we invite you to complete our online Quote Request. We look forward to working with you to provide affordable Gatlinburg accommodations that will delight your guests.